Devotees who wish to send prayers to Shirdi can send them through Sai devotee Manpreet.Request to devotees to send their prayer before 5th July as Manpreet will be travelling to India on 5th July for Shirdi .She can print prayers before leaving hence devotees are requested to keep the date in mind. Below are details.Jai Sai Ram . I love your website. I tried sending you my request through the contact page but it would not go through. I am going to Shirdi next month. I will in Shirdi on July 10th and 11th. I want to take devotees prayers to holy feet of Baba. Please post this on your website, my email is mkkaur@yahoo.com . Please request all devotees to write "Prayer to Shirdi" in the subject line and send their prayer before 10th July. 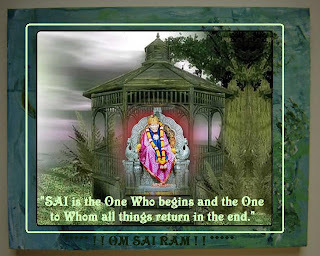 I am the one who is going to Shirdi on July 10th. I have received so many prayers from devotees and I will place them at holy feet of Baba. Please make a correction I am leaving for India on July 5th and request all devotees to send their prayers by July 4th so I can print the prayers before I leave. Baba pl., save my mother and be with her always safeguard my mummy always baba. Om Sai RAM , iam from Chennai , my son aged 3 .he is not. Normal ,not started speaking,he don't response what we say .his cognitive action is missing .pls pray for him ..